White tiles do not have to be boring! What to combine them with? White is the brightest colour visible to the human eye. Of course, its shades are much more than they can be called Eskimos (and they have more than 40 types of whites!). Pure white in nature does not exist. It always has a “direction” – towards a cool, blue or warm, with the addition of yellows. Interior designers – including designers of ceramic tile collections – draws in handfuls from natural inspiration – the colours of clouds, snow, rocks, fog, flower petals, animal furs. They also have design tools to create almost technically pure whites. 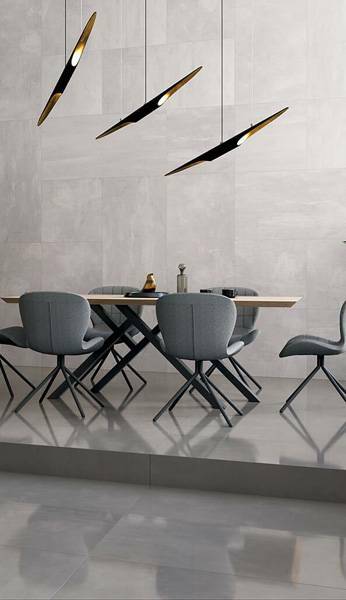 When we add to it the vastness of available formats, as well as the variety of possible tile surfaces – from matt, through structural, intentionally porous, satin, semi-polished, polished and decorated with noble lappato glaze – there is no question about boredom among white tiles. White colour is a universal base for all arrangement treatments. The obvious advantages of white are: optical interior enlargement, introducing the impression of cleanliness and brightening the rooms thanks to the reflection of the solar light. Depending on the company in which the white colour is in space, its role, power, and impact can be different. Here are some ways to use white colour in interiors and how to combine it with different motifs and other colours. White looks great with all shades of mild, unspecified pastels – from sand, pink and apricot through delicate blues, aquamarines, mint, and violets. White tiles (smooth and with geometric motifs), plus powder pink elements of the decor and light black accents in the form of fittings and mirror frame make the interior of the bathroom is subtle and spacious. 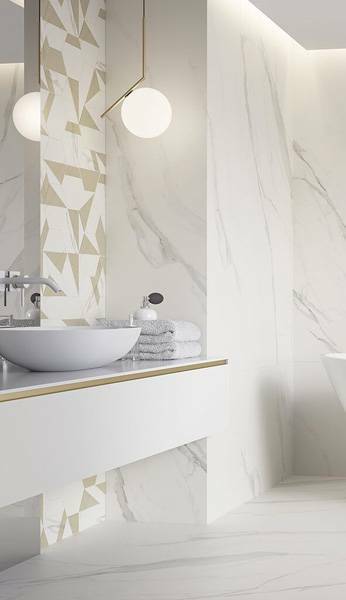 When we put on a matt white, a softened drop of cream colour and white chilled with a bit of grey, combined with subtle geometric motifs, then we will achieve a general impression of the lightness of the interior. When we add delicate pastel accents to it in the form of selected elements of the interior – for example, washbasins or shelves – then we will achieve a harmonious complement effect. Powdery pastels bring in the impression of noble sweetness. This is not the sweetness of iridescent candy, and the sweetness is much more subtle, which allows for blissful relaxation every day. White tiles emphasise the colour, drawing and structure of wood imitating ceramic tiles. That is why white and wood are one of the favourite combinations of interior designers. White tiles make for a perfect background for any expressive textures and structures – especially as impressive as in the case of wood. Colour and jars of ceramic boards are then fully embossed. In the bathroom in the attic, slender white tiles arranged vertically will make the low interior seem higher. 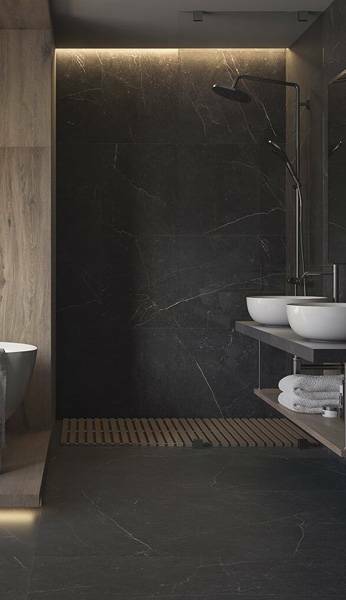 Similarly, the glossy glaze of these tiles will make the bathroom look more spacious. White plus wood is a combination that is both effective and universal at the same time. It works in almost all styles and all types of rooms – from living rooms and kitchens, through corridors, lobbies and terraces. They can also be found in offices and public facilities, e.g. hotel receptions. All strong forms gain even more definition when accompanied by white. It is no different in the case of fashionable geometrical motifs. Monochrome interiors based on white, grey and black can be even astoundingly effective. White wall tiles reinforces the geometric effect applied on the floor. The combination of these themes allows for spectacular visual effects. 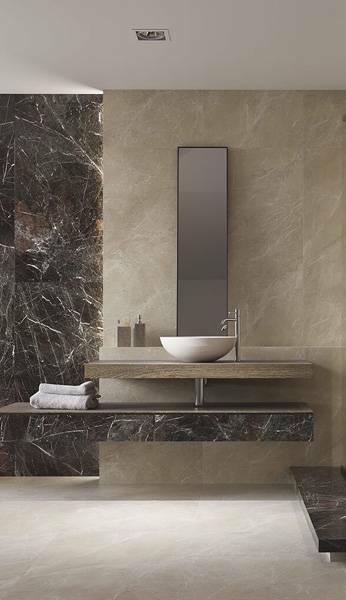 Glossy white tiles act as a mirror, faithfully reflecting the elements of space. Owing to this, they enlarge it and multiply strong design effects. How does white work? Fantastically reflects the reality and multiplies the geometric effects. Structural white tiles do not have boredom in them. They will successfully fulfil the role of the main decorative motif in the interiors, not only in the bathroom. Technological possibilities of tile manufacturers allow for almost unlimited decorative treatments on the ceramic surface. Hence the popularity of white structural tiles. Almost any spatial form, invented by the designer, can be “ironed” on the surface of the tiles. Triangles, trapezoids, convex and concave wheels, as well as soft waves and arabesques – the choice for the client is enormous. Remember that the distinctive tile structure begins to live inside your own life, becoming its main character. If you decide on structured white tiles, put on simple forms of other elements of decor and equipment. Also remember about optimal lighting, which will highlight the form of tiles. Good lighting of white tiles will introduce chic to the interior and the desired mood. We have mentioned the lighting above – it is extremely important in general, and especially in the case of ceramic tiles. Glossy – they will faithfully reflect the light, adding a glow to the interiors. Matt will diffuse it, and the structural ones will introduce spectacular chiaroscuro games, thanks to which you will introduce fashionable 3D effects. The colour of light also matters. When choosing a source of light, pay attention to its temperature. Surely, the light of the candle and the oil lamp is the warmest. Ordinary tungsten bulbs also give warm light. When choosing energy-saving lamps, it’s best to try them on, placing the tile, and check whether the obtained effect satisfies us (you need to remember what other light sources are in a given room and how they will affect the final result). White tiles do not have to have typical forms of rectangles and squares. Nothing prevents you from choosing even more interesting versions – for example in the form of hexagons. The timeless shape of the honeycomb will make the interior natural and original at the same time. Hexagonal tile shapes add dynamics to the white bathroom. Tip no. 7. Clean white! White is universal and noble. It is enough in itself to arrange beautiful interiors. Or maybe pure white? Why not! White in itself is noble and “complete”. You can bet on pure white and design beautiful, minimalist, modern or classic spaces. Of course, nothing stands in the way of breaking this cleanness – for example with a glass or metallised strip or subtle shiny lines on the surface. You can also “play” with a variety of tile sizes – from large format tiles to tiny cut and pressed mosaic (also glass). White + pastels are subtle, light, and sophisticated combination. The combination of white and wood emphasises all the natural features of wood: wood grain, wood species, colour, planks, boards and slats. It also introduces calm and eco-effect to the interior. White + geometric motifs is a radical reinforcement of the effect of line clarity and geometric shapes. White in combination with the structure is a reliable recipe for original, extremely impressive interior with fashionable 3D effects. The right lighting means that the colours used in the interior are enhanced, as well as the structure of the tiles. Pure white is also enough to arrange beautiful, original interiors.